This year Tet begins Friday February 5, 2019. Tet, or Tet Nguyen Dan to give the festival its full name, is the most important festival in the Vietnamese calendar. 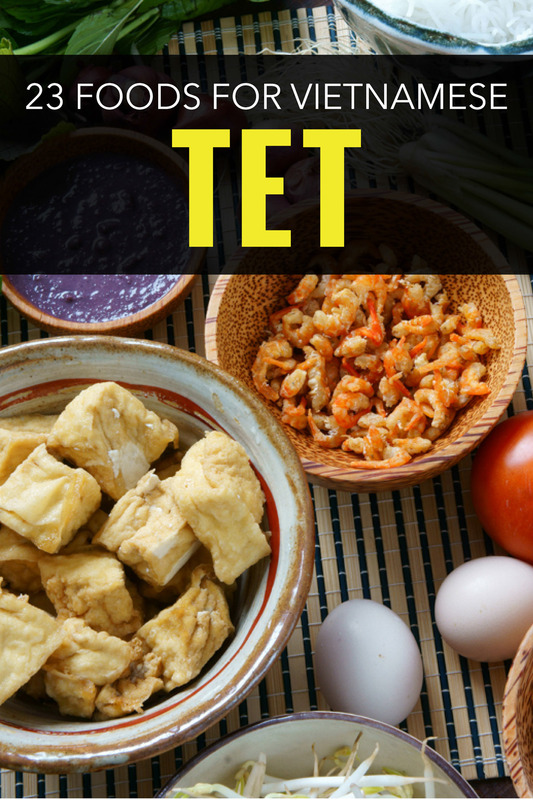 Wondering what food to eat for Tet? It is celebrated on the first day in the Lunar calendar. The festival usually lasts up to seven days in late January or early February. While it may not be as commonly known as the Chinese New Year, this festival is celebrated by millions every year. It’s a time to show appreciation to ancestors and spending time with family is very important. Like all great festivals there are many foods that have a significance at this time of year, which is the most fun of any holiday. 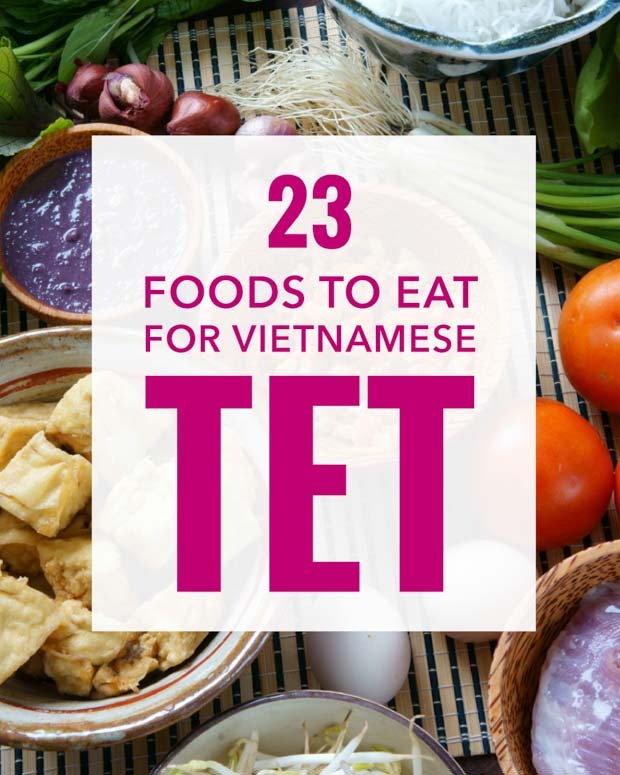 Here are 23 delicious foods you will find in many Vietnamese homes during Tet. Also known as banh tet because of its association with the holiday, this rice cake is made with sticky rice, pork and mung beans. Banh Chung is prepared before an event. It’s then wrapped in banana leaves and presented as a package during the festival. Also known as red sticky rice, the distinctive red color of this dish is very important during the festival as it symbolizes good fortune and happiness. 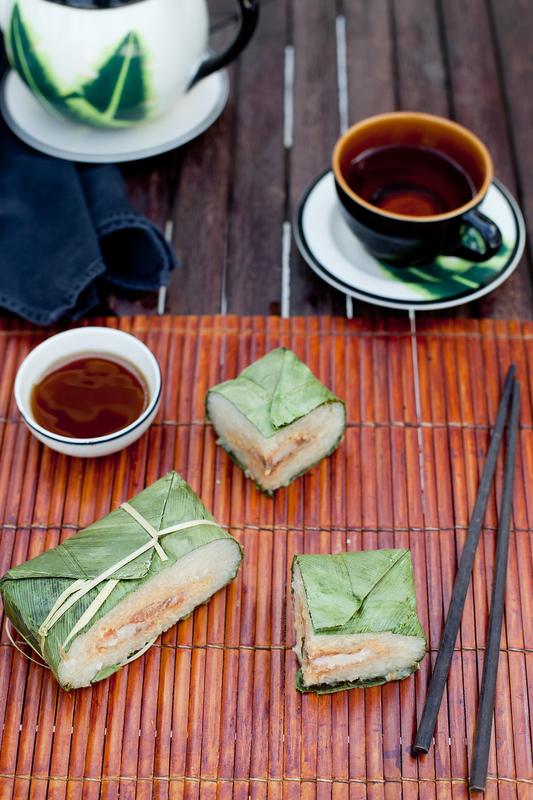 Xoi Gac is made by cooking sticky rice and combining it with baby jackfruit flesh. Authentic xoi gac never uses food coloring. Cooks place jackfruit seeds on top to show that the colour is from the fruit. Chicken plays an important role in the festival and is used in meals where the ancestors are remembered. Chicken is steamed or boiled and the traditional way to serve it is sliced or chopped. Welcoming visitors to your home is an important part of the Tet festival. 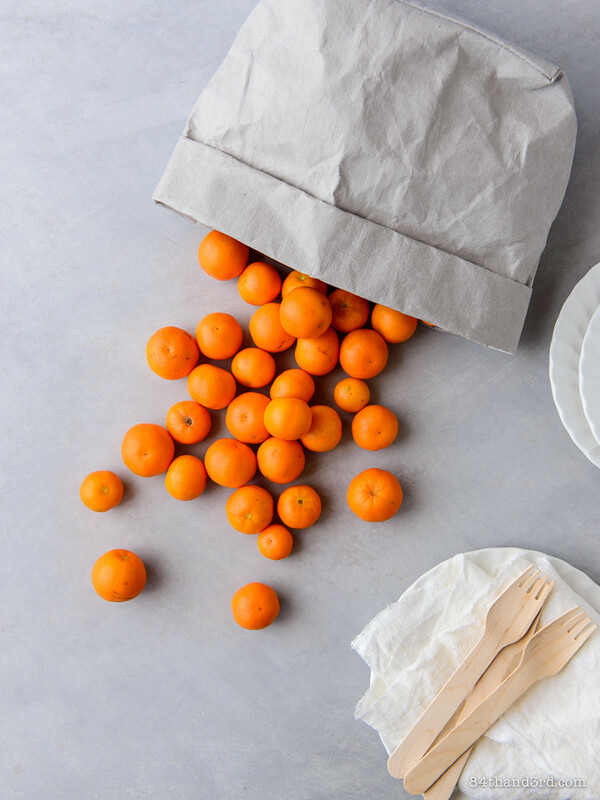 Guests are offered a selection of dried fruits and nuts as a traditional snack that often includes pineapple, coconut, star fruit and even seeds and candied ginger. Similar to the spring rolls found in China, these tasty treats are usually made with ground pork, mushrooms and chopped carrots. 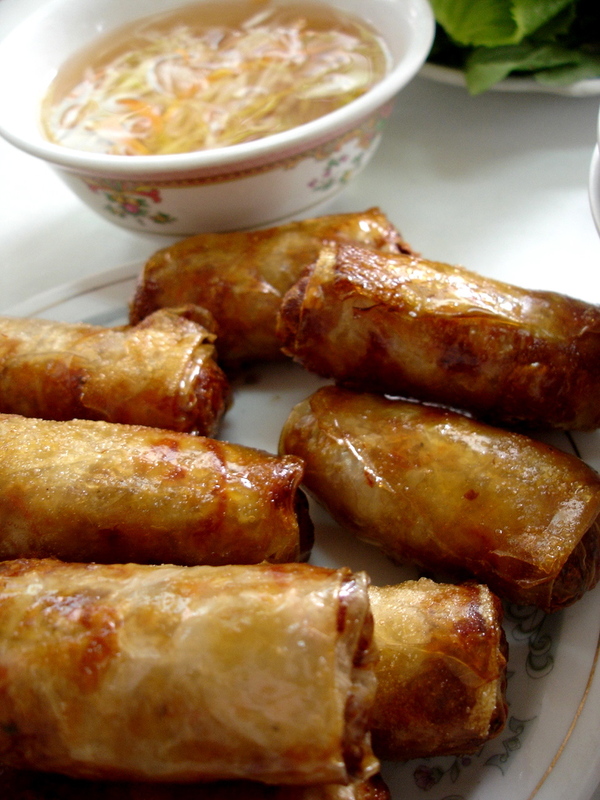 Common in southern Vietnam, the filling is wrapped in a sheet of rice paper and deep fried. Gio nac can be made with many types of meat, but is usually made with pork or beef. Meat is finely mashed, then wrapped in a banana leaf to be boiled. This leaves a smooth white cake which is cut into slices. This tasty treat is presented to guests as snacks during the Tet festival. Watermelon seeds are toasted and then split, with both black and red varieties available. Another common snack that can also be served with meals. Dua hanh are small pickled shallots that have been cured with chili, ginger and fish sauce before being stored in rice vinegar. 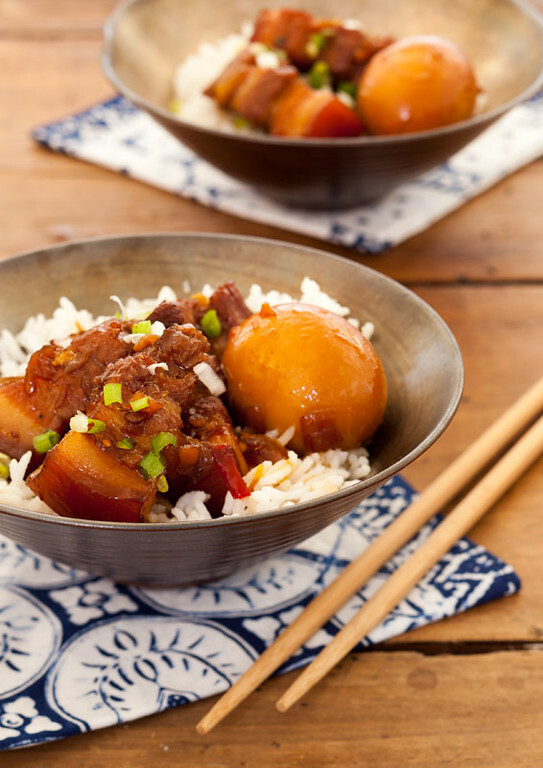 This delicious dish includes pork meat that is marinated and braised. It is then cooked with coconut water and eggs, and the combination makes for a lovely stew. Tet is all about spending time with family, and that includes preparing meals. Thit heo ngam mam are rolls of meat soaked in fish sauce with chopped vegetables and herbs. It is very common for children to make this with their parents during the festival. One of the more significant foods during the Tet festival, although it isn’t one offered to house guests. A tray of five fruits is placed on the altar as a sign of respect and gratitude to the family’s ancestors. An ornamental piece that can be quite elaborate, the fruits vary depending on what region you are in often includes more than five fruits. A fermented sausage that is spicy, sweet and sour. It’s usually served cubed with garlic and chili on top and served as a part of the main meal during the Tet festival. This soup is made with bamboo shoots and a variety of other vegetables, which are then combined with pork and softened bamboo to make a hearty soup. A salad that provides a dash of color and texture to a festival meal. 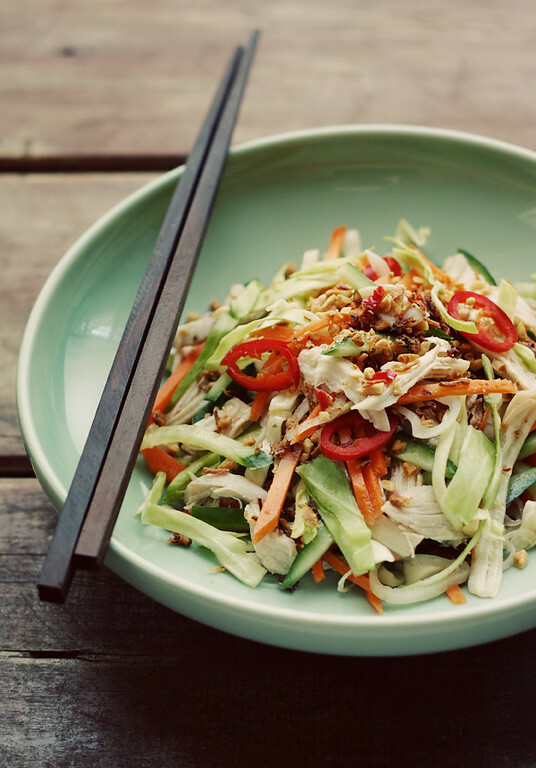 This sweet and sour salad can be served with or without meat, and is an essential on any Tet dinner table. One of the most important parts of the Vietnamese culture is to use all parts of the meat. This dish uses the meat of the pig’s head which is finely diced and wrapped in a banana leaf before being steamed or boiled. This northern dish makes good use of the traditional cold weather during the festival period. Thit dong is a variety of chopped cooked meat which is then frozen outdoors, and then served with a pickled onion. These fruits have a significance during the festival, with the entire plant used to represent the family tree. The most symmetrical fruits and leaves are chosen for displays. Thia bo kho que is a warming dish originates in the north of the country. Beef is marinated in garlic juice and salt, and then cooked with soy sauce and cinnamon. It’s traditionally served with boiled carrots. Beef is one of the most popular meats to use in Central Vietnam during the festival, Bo kho mat mia is made by braising the beef with molasses, ginger, lemongrass and cinnamon to make it tender. A variety of pickle, this is made with the distinctive Chinese onion bulbs, which are common in the markets of the country. It’s so common that you’ll often see the onion roots hung out to dry before the festival. Bitter melon is one of the fruits that is more common in asian countries than it is in the west. This is a significant dish for spirituality, where the bitter melon is stuffed with diced pork and herbs. Another common pickle eaten during the Tet festival. Dua hanh ia known as welsh onions in English; however, the plant is actually native to Asia rather than Wales. Very similar to the cha gio rolls that are eaten in the south of the country, Nem Ran are eaten across Northern Vietnam during Tet. These rice paper rolls wrap ground meat and diced vegetables. Another prominent soup during Tet. Canh bong thap cam is made with carrots and peas, combined with dried pig skin and the shrimp. It all looks and sounds fantastic, especially loving the look of those Gio Cha. Perfectly golden and crispy! It’s Cha Gio. Not Gio Cha. Thank you so much for the comment, I’ll make the change right now! what a comprehensive guide. And some of that food looks utterly delicious! This is such an interesting post. I didn’t know anything about Tet and have a lot to learn about Vietnamese food. My daughter travelled there last year and raved about the cuisine. oh, they are so special. Vietnamese foods are so delicious not only on tet holiday but also normal day. Vietnamese food is the reason why many people come back to Vienam once more time. I came across this post, can I suggest some corrections and some additional information? 1. Tết is Vietnamese New Year. Bánh chưng is a square shape similar to your picture, and Bánh tét is in a log-like cylindrical shape. Also as you can see with the accent mark, Tết and tét are not the same word in Vietnamese. Tét referring to the fact that it is served in slices. 2. It’s chả giò, not gio cha. Giò Chả the combination for giò lụa and chả lụa. 3. I don’t think gio nac is a common term, typically it’s known as chả lụa (South) or giò lụa (North). 4. Nộm is a northern Vietnamese term, in the south it’s known as gỏi. 5. 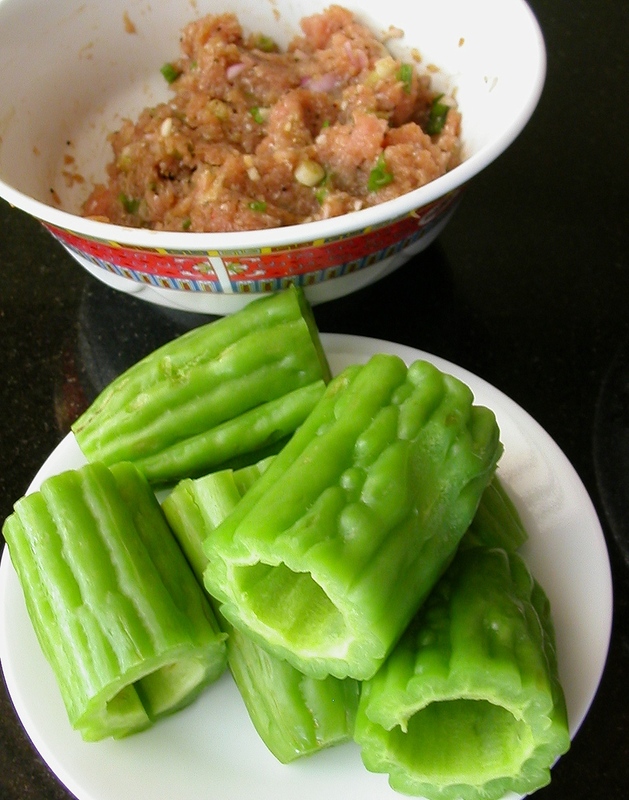 Canh Kho Qua ‘Don’ Thit, it’s typically known as canh Khổ qua ‘nhồi’ thịt. Thank you so much for the comment, do you mind if I revise the post with this information? Thanks Ayngelina for this post. I had taken over cooking for Vietnamese New Year in 2017, my mom is older and the food doesn’t taste like I remember growing up. This post is a great start for my research and understanding for the food and tradition. Thanks Vy Vu for the correction, I had planned to look up the terms I didn’t recognize . I grew up hearing the South Vietnamese terminologies, your replies helped a lot. Thank you so much for sharing this mouth- watering post. Vietnamese food are really delicious and they are freshly and healthily prepared. I enjoyed reading all of the these Vietnamese cuisine that they prepare for Tet, really informative. Wow! The closest I have eaten of any of these dishes is a variation of the Indonesian dish Nasi Goreng. The only difference the Vietnamese version had was the instead of shrimp chips, they had some edible wormy stuff – don;t remember the name. It was okay but I prefer the original, lol. But, thanks for writing this – makes me prepared before my visit there some day. Just came across your post as I search the food for Tet given it is almost upon us again. Very helpful information. Have seen the whole chickens at the local market, my landlord has already given me some Xoi Gac, and the streets are filled with kumquat trees (here in Hoi An). Looking forward to enjoying more of the Tet food over the next week or so.